If you're building your own sunroom, you might be tempted to consider cheap sunroom windows to keep costs down. When it comes to sunroom windows, you really do get what you pay for; because windows make up the majority of the room's structure, buying cheap windows might not be the smartest move. However, that doesn't mean there aren't still a few ways you can find less expensive sunroom windows so you can keep your building costs manageable. Homeowners should be wary when a manufacturer gives them a price for sunroom materials that seem too good to be true. Quality materials like good framing and windows do not come cheap. Low-grade windows or building materials might save you some money on your building costs, but they will wind up costing you tons more through increased heating and cooling costs. Some less than reputable builders will try to win the job by substituting cheap sunroom windows and swaying the homeowner to agree by claiming that a window is just a window. Others may use conventional single-paned windows in place of sunroom windows, while making this sound like a perfectly viable option. In both cases, the builder is wrong. Other things to consider include impact-resistant glass, tinted glass and a hydrophilic exterior coating on the glass to reduce the frequency of cleaning the windows. These are all options which will increase the price of your sunroom windows so if you're trying to keep your prices down, only opt for the features you need over the ones you'd like to have. While you don't want to settle for cheap sunroom windows, less expensive sunroom windows is another thing entirely. 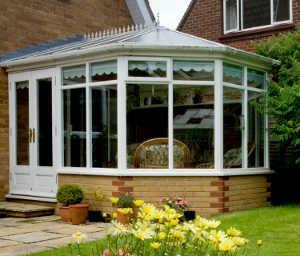 There are ways you can get good quality sunroom windows for less money. One of the best ways to find inexpensive sunroom windows is to look online at sites like Craigslist or eBay. Often, homeowners will sell sunroom materials purchased for a sunroom that may have got scrapped, especially in tough economic times. Meanwhile, other homeowners might want to do away with their existing sunroom and may offer the windows for free to someone willing to disassemble their sunroom for them. It's a lot of work, but you could save yourself thousands if you get lucky. If you don't want to go the second-hand route, wait for your local sunroom dealer to have a special sale, like an early-bird spring sale. During these types of specials, the dealer will often throw in a certain number of free windows for a certain number purchased. Lastly, don't enter the showroom without first researching the going rates for sunroom windows. Buying a sunroom kit or sunroom windows in general is a lot like buying a car; the better prepared you are, the more likely the salesman won't try to pull a fast one on you. Have your information ready and be prepared to negotiate and you will walk out knowing that you got the best price possible for the best sunroom windows in your budget range.